Squash House Quilts: Cute Finish and a Wrangler! Thanks to all of you who have sent well wishes! I feel a bit better every day and am well on my way back to normal! 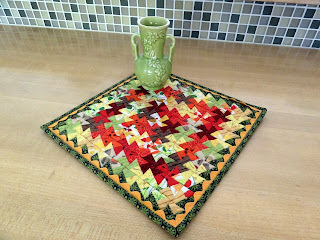 As my friend Kaaren over at The Painted Quilt said, quilting is like Chicken Soup! You're so right, Kaaren! Here is my finished Itty Bitty Primitive Pinwheel quilt! This little cutie measures only 10 1/2" square! I think the added orange rick rack around the edges was just what it needed! Next month Mr. Squash has a temporary position as a Wrangler! 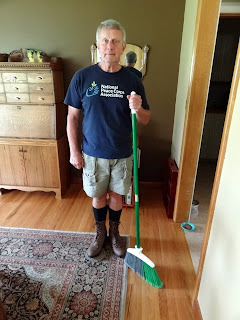 He is going with Otis (who married us) in to the Eagle Cap Wilderness for about 12 days. Otis is leading an elk hunt for several fellows. Mr. Squash is going to stay in camp and keep an eye on the stock during the day while the fellows are out hunting. The bonus for him is that he can also fish all day right from camp! We got him some new riding boots, so he thought he would break them in around the house while doing chores! He promised I could take his picture for some peanut butter on celery! What a guy! That is the cutest little twister ever. Do you hire Mr. Squash out? I can provide lots of celery and peanut butter for pay! Your Twister turned out great. Now Mr Squash...not sure about the fashion statement! But hey, any guy willing to use a broom has to be ok! Glad you are starting to feel better. Love your tiny little pinwheel quilt; it's so colorful. Glad you are feeling better! Your Twister is so happy and vibrant; like the saying "Quilting is like chicken soup for the soul." Hope Mr. Squash has a good time with the guys and fishing. Just love your TWISTER! Adorable ! Glad to hear you are feeling better. Hope Mr Squash catches lots of fish ! I like that little twister quilt~~ and you're right about that orange rick rack providing just the perfect touch. Had to laugh about Mr. Squash. He'd fit right in with my brother who sometimes wears his cowboy boots with his shorts and t-shirt!!! He most certainly couldn't care less about how it looks, either. Smart to wear those new boots around the house a lot, though, and get them broken in before heading out into the wilderness. Glad you're feeling better. Oh...that is sooooooooooooooooooooooo adorable....I don't know if I have it in me to make something that small. you two crack me. I know Mr. S will have fun fishing. Glad you are feeling better and your little quilt is very cute. the rick rack is perfect. Does that mean elk will take up residence in your freezer?? What a lovely finish! The ricrac is a fun touch. Great boots! I am still breaking in a tough pair from a couple of years ago. Is it any wonder I keep them until they fall off my feet. Oh my Mr. Squash is quite the fashion statement! Have a wonderful time in Colorado! Take care of yourself..